For me, Star Trek started with the syndicated show in the 70s, then the movies, and the different television shows and continued movie. In Elementary, I started getting my love of taking pictures, with a simple camera on vacations. By High School, I received the birthday gift of a Cannon AE-1 camera, my first real professional camera. I loved taking pictures, but was not popular with the photo developers, because I experimented a lot. In the summer of 2016, the Las Vegas 51’s AAA Baseball Team celebrated Star Wars Day. 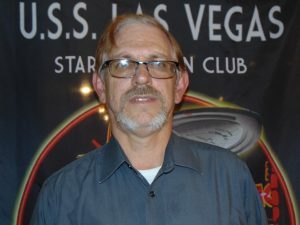 At that game, I met two members of the USS Las Vegas Star Trek Club, and by the following month, I was a member of the club. Since then, I have become the Ship’s Historian, taking as many pictures of events that I can attend, including the Renaissance Fair Away Mission, and Toys for Tots. I am also one of the Co-Hosts of “Trek Talking” Podcast on BlogTalk Radio with weekly discussions of just about anything Star Trek and Sci-Fi.